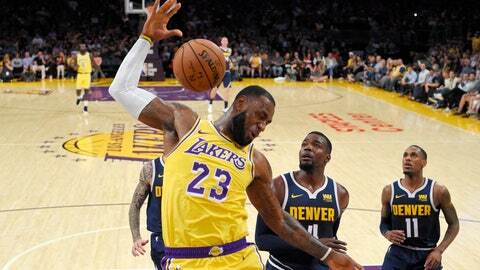 LeBron James watched Lonzo Ball play in Las Vegas during the 2017 NBA Summer League, taking in a Los Angeles Lakers‘ game from a baseline seat as a spectator. James and Ball were on-court teammates for the first time when the Lakers beat the Golden State Warriors 123-113, back in Las Vegas. Ball didn’t start the preseason contest, but replaced Rajon Rondo just 2 minutes, 13 seconds into the game. “It’s just fun to have our full group,” James said. James and Ball didn’t play very much. Ball has been recovering from a knee issue, and it was his first appearance this preseason. James didn’t want to burden his new point guard with a lot of expectations, so he was keeping his approach very simple. It was James’ first game against the Warriors since last season’s NBA Finals — when his second stint as a member of the Cleveland Cavaliers ended with Golden State sweeping its way to a second consecutive championship. But he downplayed the exhibition being any extension of his rivalry with the Warriors, or the rivalry between the California clubs. WIZARDS: Markieff Morris scored 15 points and Jason Smith added 14. … Washington once led by as many as 14 before needing big plays from Wall late to pull out the win. PISTONS: Detroit took 45 shots from 3-point range, 42 from 2-point range. … Reggie Bullock was 4 for 8 from beyond the arc. GRIZZLIES: Memphis was outrebounded 54-38, and 12-1 on the offensive glass. … Marc Gasol and Jaren Jackson each scored 10. MAGIC: Orlando took control with a 12-1 run in the second quarter. … Rookie Mo Bamba didn’t play because of a bruised wrist. PELICANS: Anthony Davis and Jrue Holiday rested. … Nikola Mirotic scored 19, while Elfrid Payton and Darius Miller each scored 17. … New Orleans’ 24 turnovers turned into 39 Miami points. … The Pelicans shot 56 percent and never led. HEAT: Dwyane Wade, Goran Dragic, Hassan Whiteside, Wayne Ellington, Rodney McGruder and Justise Winslow all got the night off. … Kelly Olynyk was 2 for 8 in 13 minutes, all of his shots coming from 3-point range. SPURS: The Spurs shot 55 percent — and allowed Atlanta to shoot 58 percent. … Bryn Forbes scored 22 points. DeMar DeRozan and Derrick White each had 15. … White started at point guard in place of Dejounte Murray, who tore his ACL earlier this week and will miss the season. HAWKS: Alex Len finished with 16 points and 10 rebounds. … Kent Bazemore scored 15 points. NETS: D’Angelo Russell scored 18 points and Caris LeVert finished with 13. … The Nets were outscored 35-11 in the third quarter. RAPTORS: Toronto was 16 for 36 from 3-point range, with Green going 6 for 7 from deep. … Fred VanVleet and Jonas Valanciunas each had 11 points. Thaddeus Young, who missed Indiana’s first three preseason games due to a foot injury, made 8 of 12 from the field and finished with 16 points and 10 rebounds in 29 minutes. BULLS: Bobby Portis made his first start of the preseason, scoring 20 points on 8-of-11 shooting. … Jabari Parker, who signed a two-year, $40 million deal with Chicago in July, had 11 points in 26 minutes off the bench. … The Bulls hit 13 of 30 (43.3 percent) from 3-point range. PACERS: Rookie Aaron Holiday hit three 3-pointers and finished with 15 points. … Domantas Sabonis had 13 points and nine rebounds in 20 minutes and Victor Oladipo scored 12 points with seven turnovers. UP NEXT: Chicago (2-2) hosts Denver on Friday. Indiana’s preseason ended at 2-2, and the Pacers open the regular season at home against Memphis on Oct. 17. TRAILBLAZERS: Damian Lillard and CJ McCollum (coach’s decision) did not play. … Evan Turner (shoulder), Gary Trent Jr. (quadriceps) and Moe Harkless (ankle) — a last-second scratch — missed the game due to injury. … Nik Stauskas had 10 points, seven rebounds and five assists and rookie Gary Payton II scored eight points in eight minutes. WARRIORS: Draymond Green (knee) did not play. … Kevin Durant had 18 points and 12 rebounds before fouling out in 24 minutes. … Golden State made just 20 of 36 free throws and committed 25 turnovers. LAKERS: Ball had seven points and four steals. … Kyle Kuzma scored 22 points and Kentavious Caldwell-Pope added 20. … Los Angeles made 38 of 46 (82.6 percent) from the free-throw line.